I love the last couple of days before Christmas. Most of the shopping is done, schools have broken up and our days are free to do lots of Christmas Activities. 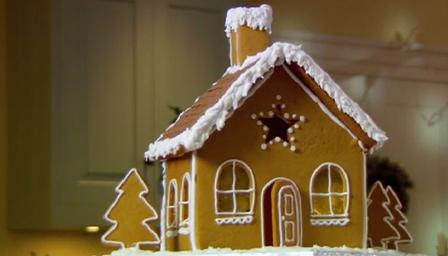 If you have lots of time (and patience) you can make a Gingerbread House from scratch using a template or cutters. Alternatively all of the supermarkets sell a Build Your own Ginger Bread House kits for £4 – £5. They are such fun to make and taste delicious! Top tip: If you can afford it buy two kits as you’ll find yourself wanting to join in this activity too! Paper Snowflakes look so pretty on windows and bunting around the home at Christmas. They are quick, fun and inexpensive to make. There are lots of templates on line for making traditional paper snowflakes but you can make anything, even Star Wars Snowflakes which would be popular in our house. Paper chains are so simple to make. Ideal to make when watching Christmas tele. If you do need a tutorial the National Trust have one on their site. Hang your finished paper chains as decorations around the home or on the tree. 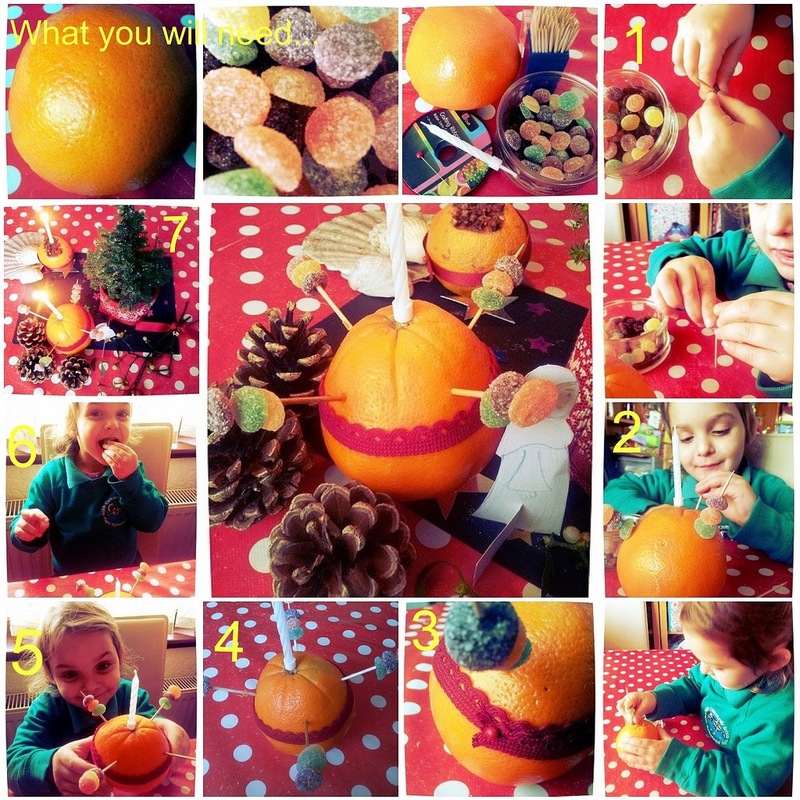 Tell the story of the Christingle and then make these bright, naturally scented ornaments. Light your Christingles and then cuddle up and read Christmas stories together. 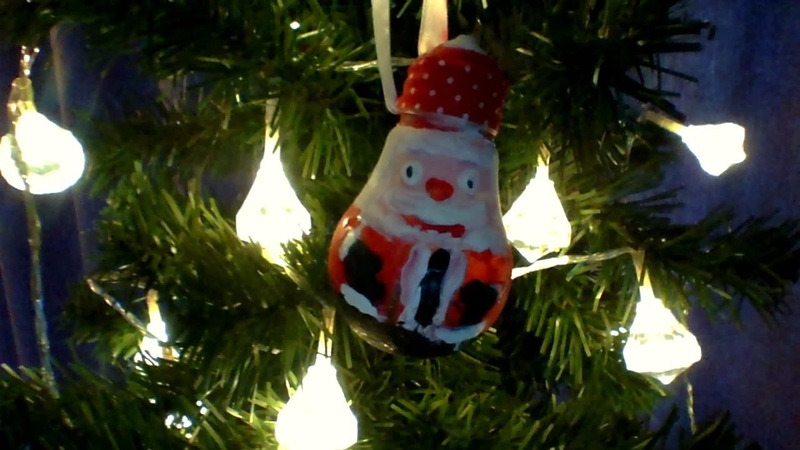 A great way to use up old lightbulbs is to paint them as Lightbulb Christmas Tree Baubles. You can paint a design, such as Santa above, however it’s a really nice idea to print your baby or child’s hand print on the bauble as a Christmas keepsake. If you don’t have any traditional shaped lightbulbs (we have more of the energy savings lightbulbs nowadays) then put a hand print on a plain bauble. 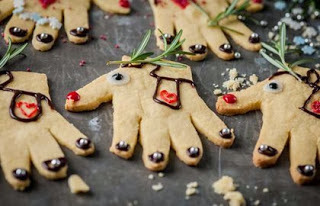 A fun Christmas baking activity for kids is to make Reindeer Handprint Cookies. They’re easy to make and make a great Christmas Eve snack- for the kids or Santa and lovely handmade gifts. These Italian Vanilla Christmas Cookies also make great gifts. 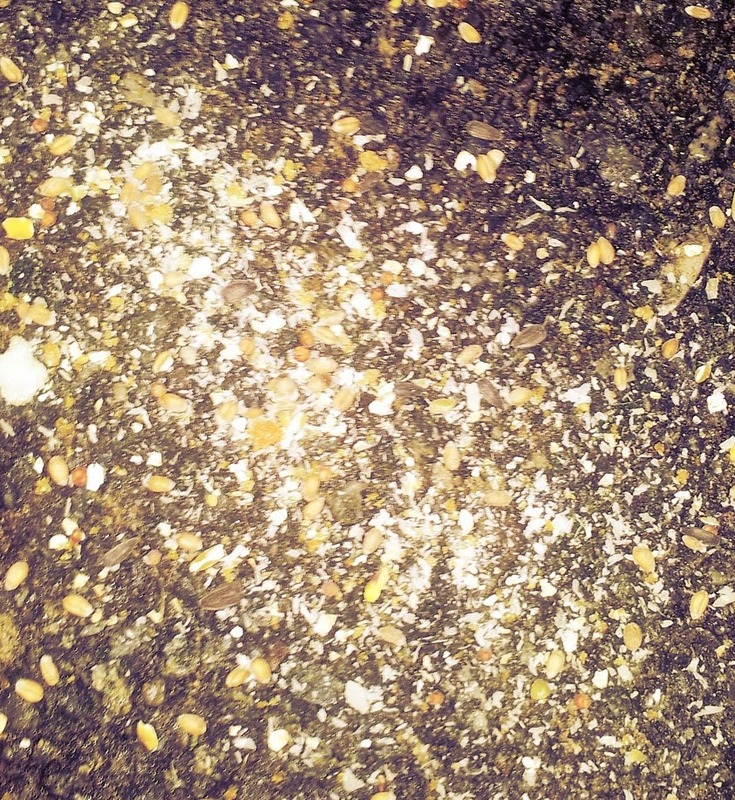 Mix some bird seed, oats and a little sugar or edible glitter together to make some reindeer food ready for Christmas Eve. It needs to be harmless to wildlife in case birds eat up any scraps that the reindeer leave. Pour it into a jar, little fabric bag or decorated envelope. Take a walk around the neighbour hood to really appreciate the decorations and Christmas lights. Every year, I make a personalised Santa message for the kids using the Portable North Pole (PNP). It’s quick to do- add some personal messages and upload a photo and you’re done. I always use the free option but you can pay and get more options to personalise if you wish. With the premium version you also find out if you’re on the good list or not. Then, the kids get to come and watch their message from Santa. 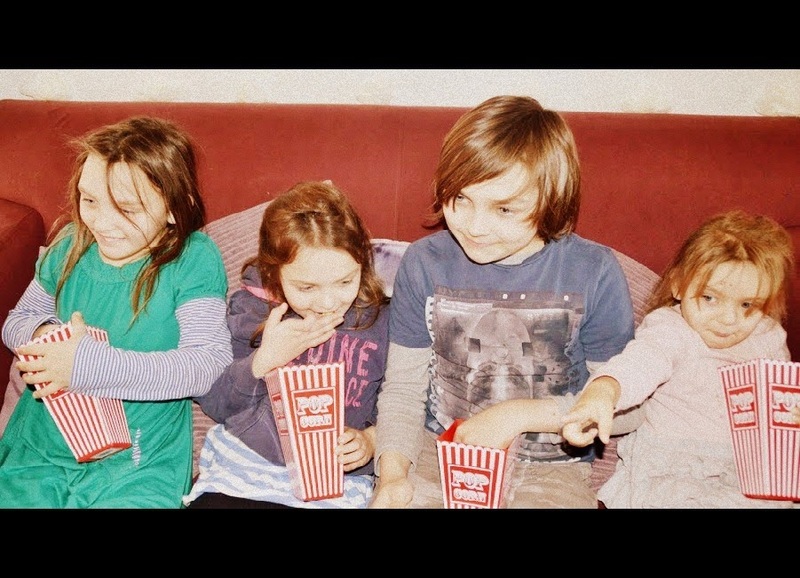 It’s not Christmas until we’ve settled down to watch lots of Christmas movies. Get comfortable, watch a TV movie, grab your favourite Christmas DVD or make your way through the “Festive Favourites” on Netflix. They have all the greatest Christmas Movies including A Christmas Carol, Home Alone and Arthur Christmas. 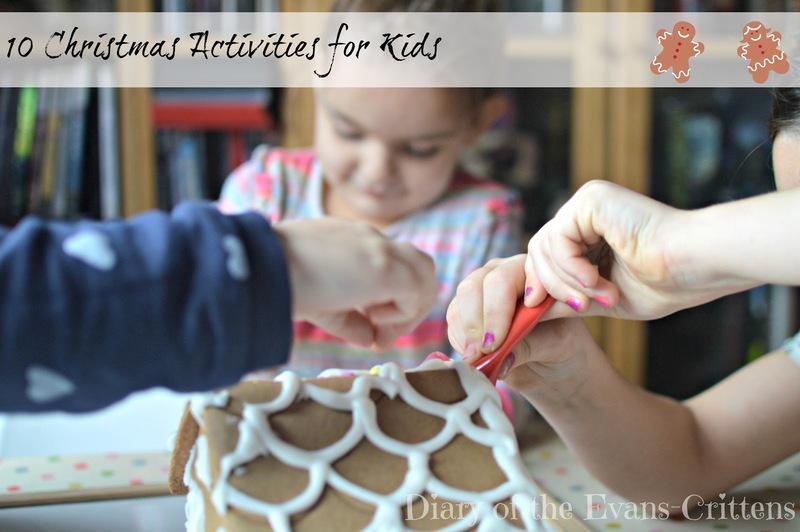 I find keeping the kids busy in the days leading up to Christmas helps them control their excitement and get to sleep each night (the more sleep they get the more time I get to prepare for Christmas! ).